Loneliness is the great modern public health epidemic, but could friendship apps help us reconnect? When Valerie Stark moved from Moscow to London, she didn’t know anyone. She worked hard, had a great job and fell a little bit in love with this big, grey city. But, she was lonely. She only socialised during work hours and didn’t know how to convert work mates to our-of-hours friends. Sharing this city with 8.8 million strangers didn’t make that loneliness any less daunting. And so, Valerie decided to solve her own loneliness problem using technology (the very thing that so often gets blamed for our increasing isolation). She invented the friendship and dating app Huggle, which now has 300,000 users and one million swipes a day in London. Huggle’s charm is that it tries to bypass superficial judgment, linking people first by location rather than by photograph. The idea is that you check into a place and you’re able to see who else is in the vicinity, meaning you instantly have something – your location, so maybe your interests, hobbies or pub roast preferences – in common. Huggle is just one example of loneliness-fighting tech. 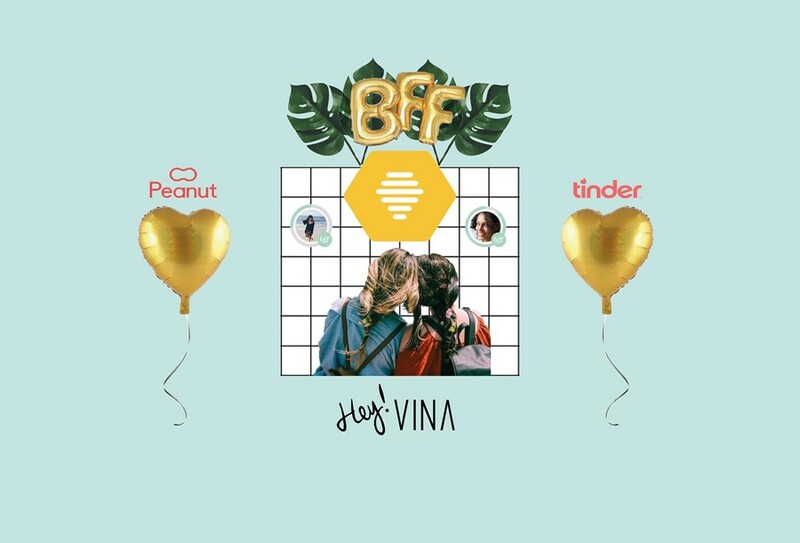 There’s a relatively new friendship app made specifically for women, by women, called Hey! Vina. It was created by Olivia June Poole and Jen Aprahamian. They too created the app to cure their own loneliness – particularly, they say, because they work in the still male-dominated tech industry and they noticed their social circles shrinking as people got married and had kids. The novel thing with this app is that it shows you profiles and photos and also uses an algorithm to try and match you with the women you’d most likely get along with – and to help the algorithm along, you can do quizzes. If you’re looking for more options, you can also switch the popular dating app Bumble - which was designed so that women could make the first move and control the tone of the conversation with a prospective date – to “BFF Mode”. Bumble currently gets 10 billion swipes a month and has facilitated 2.5 billion messages between humans with smartphones. Among those furious messaging Bumblers are all sorts of people just trying to diminish their own loneliness. There’s also an app called Peanut, which is for new mamas. Harriet met Lucy earlier this year on Bumble BFF after she did a life inventory near her 28th birthday and decided she needed at least one new, good quality friend. She was working hard and at a bit of a loss as to how to meet someone outside the office. Going up to someone in person was all too much, so she decided to try the app. Harriet, Valerie, Olivia and Jen were not alone in feeling lonely. A study by The British Red Cross suggests that 9 million people in the UK are either always or often lonely. According to the Mental Health Foundation, 48 per cent of people believe we are getting lonelier as a society. An Emotional Needs Audit of the UK by the Human Givens Institute18, which spoke to 4,600 people, found that 24.1 per cent of people did not feel emotionally connected to others, 34.8 per cent did not feel connected to the wider community and 35.4 per cent felt they did not receive enough attention. “Loneliness is a major issue; in fact, it is reaching levels akin to an epidemic,” says Laura Alcock-Ferguson, Executive Director of the Campaign to End Loneliness. “Older people are particularly affected by chronic loneliness, with 1.2 million people feeling lonely most of the time – but we know it impacts younger people too. In fact, our research found that over half of adults in the UK would find it difficult to admit to being lonely. The stigma surrounding loneliness is huge, and it affects all ages. But loneliness is dangerous for physical and mental health, and it must be addressed. So if you’re feeling lonely – maybe your friends have moved away or nestled into romantic relationships, maybe you’re working from home or have a disability, maybe you simply feel alone in a room full of people – then it might be time to something about it. You’ve probably got a smartphone in your hand… start there.